The East Texas Police Chiefs Association created the East Texas 100 Club, Inc., a 501c3 Foundation. The 100 Club is a group of regional business owners and citizens committed to helping survivors of First Responders and improve law enforcement capabilities by providing funding resources as approved by the board. (See State map below for counties this Club will cover. 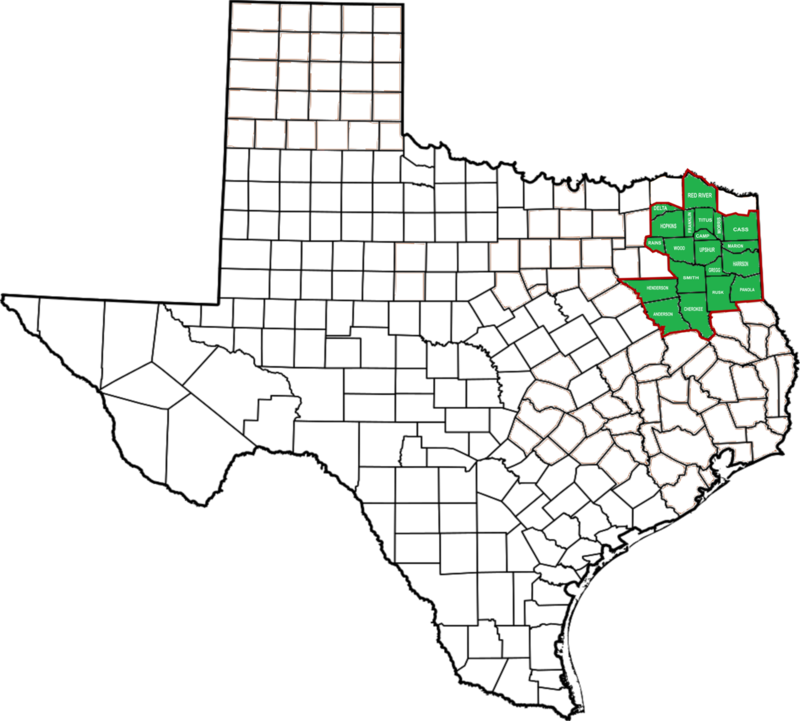 The 20 counties in East Texas are in green.) By supporting this Foundation, we can assure survivors of first responders will be able to continue after their loss and set long term goals for improving law enforcement resources. In 2017, Mount Pleasant Police Chief Wayne Isbell began the process of starting the East Texas 100 Club. His tasks and challenges covered many areas and he presented the project to the East Texas Police Chiefs Association (ETPCA). The issue at hand was the lack of regional support for law enforcement families when an officer died in the line of duty. Many areas in Texas had already taken on the challenge of helping Gold Star families financially. With the support and guidance of the Houston area 100 Club and with the assistance and support of ETPCA, the Club was founded in 2008 as a 501c3 tax exemption Foundation. The official kickoff was held in January 2019 with a joint press conference held by Sheriffs and Police Chiefs from the supported 20 county east Texas region. In 1953, a group of five men in Houston – consisting of Leopold L. Meyer, Ray R. Elliot, R. H. Abercrombie, William A. “Bill” Smith, and Jim “Silver Dollar” West – realized the need to support the dependents of Houston police officers killed in the line of duty. So, they reached out and motivated 100 people to contribute $100 each toward the mission. Thus, the 100 Club was born. For nearly 50 years, the organization focused on police officers, but in 2001, The 100 Club expanded to support firefighters. As new counties have been added and new public servants have been supported, the mission has always remained the same. And today, the organization has grown from 100 humble members to more than 30,000 strong. Since then, several other areas in Texas have started their own 100 Club to handle survivors in their local area. Many of the 100 Clubs in Texas also provide funds for training, bullet proof vests and equipment to prevent the officer’s loss of life. WE would like to explore any ideas to keep our first responders safe. The East Texas 100 Club appointed the first Board of Directors in 2018. This Board consisted of only law enforcement officials from east Texas. The process of Board representation moved from law enforcement to a civilian Board on January 1, 2019. The civilian board is represented by east Texas business owners, community members, a Gold Star member, and local government politicians. You can view who our Board members under the contact tab on the home page. The Board has elected officers, decide on fund raisers, decide on how WE will provide for our survivors, and handle all matters relating to the East Texas 100 Club. This Club was started to make a difference in our region. As we progress the Club will add more public safety groups to our benevolent program. We understand all public safety officers and families are impacted and we pledge to support our hero's. We need and want your support. Become a member today. This is an opportunity to make a difference in our region and in your community.